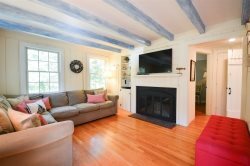 This charming, newly renovated Sea Captain's 5 bedroom home is a blend of the old and the new and is tucked back on the ocean side of Wellfleet's Cahoon Hollow Road. The house was built in 1830 and was formerly a 'bed & breakfast' and now is under new ownership. The house has been updated, painted and renovated so your family can enjoy the charm and spaciousness of a historic home with the convenience of modern amenities. Generously sized living room and dining area with beautiful wide plank floors. Lots of great features; newly renovated 'beadboard' bathroom with new fixtures (toilet, shower, vanity) cozy den for reading or virtual remote work (wifi), all 5 bedrooms upstairs have premium beds (mattresses and fresh pillows), claw foot tub in upstairs bath and outdoor shower. Rare opportunity to experience the real Wellfleet and enjoy all that this gem of a town offers - the ocean, the ponds, wonderful art galleries, awesome food, entertainment and incredible days filled with sun, surf and relaxation. Wonderful centralized location - easy access to Wellfleet's best beaches and fresh water ponds. Great Pond is 1.5 mile and Cahoon Hollow Beach is 1.9 miles, just a bike ride away. Also located a short walk into town to Wellfleet Center via Uncle Tim's Bridge. Central location gives great access to Ocean, Pond, Bay, and Bike paths. Wellfleet is a small village on Cape Cod known for its many art galleries and beautiful beaches. The beaches and glacial freshwater ponds are part of the Cape Cod National Seashore. In addition, there is a natural harbor in Wellfleet where boats can be rented and sports fishing is available. The town has many fine restaurants and there are two summer actors theaters and a very active arts community. Another wonderful attraction is the Wellfleet Drive-In Theater which has been entertaining six generations of summer visitors. Welcome to ‘Cedardown’. This house was built in 1830 and the ‘new addition’ was completed in 1906. Cedardown was purchased in the early 1940’s by my grandparents, who had 5 children and 18 grandchildren and enjoyed more than 55 summers here. The house has been at the focal point of our family history and has hosted 3 weddings, lots of reunions and many important family milestones. It has always been a magical place. I hope that you will be able to feel some of that magic during your stay with us. Cedardown was sold in 1996 and then operated as a bed and breakfast for 13 years. I purchased the house in the spring of 2011 and I’m lovingly restoring it to its former glory. Thank you for deciding to stay with us here at Cedardown. I hope you will be able to relax and enjoy the ocean and ponds and have a great Wellfleet experience. *Any issues with accidents - urination or throwing up? *Any issues with chewing furnishings? *Barking while unattended or while attended? *Does your dog receive flea and tick preventative? *Are you confident you can leave property with no sign of your dog when you check out? *Do you accept full responsibility for the behavior and impact of dogs in your group during your stay? Our family loved this charming house. We especially enjoyed the fire pit outside! Would definitely recommend to others vacationing in the Cape Cod area. We had a lovely and memorable stay; classic Cape town, great restaurants, lovely beaches and NO crowds since we were there mid-September. No packed beach parking lots and no lines in the restaurants. Bliss. Having said that, remember that the house is great but well lived in. There are a few things to keep in mind for future renters: we had a just walking 1 1/2 yr old and the house was less than ideal lacking stairs barriers and no cot or high chair for a youngster, so bring your own. Having said that, the house is really well equipped, In the end, a lovely stay was had. Overall, I recommend this vacation rental. For our annual trip to Wellfleet we were very pleased with this house at Cedardowns. The home easily fit our group of 10 people and has ample room for everyone to have fun in communal areas but also have enough space foreveryone to have privacy. The location is great, conveniently located near great pond (our fav), close drive to beaches, and easy trip into town. We liked the cleanliness of this home, loved the outdoor shower, and were very satisfied with proximity to things we like while also feeling that the property is very private. Great house overall and great experience! We very much enjoyed the old house...very much fits what we would want on Cape Cod...we especially liked the outside shower! I highly recommend it! I do think the outside shower could have been cleaner (cobwebs, etc)...but, it was outside! :) This is a great location on this part of the cape. This place was great. Plenty of room for everyone to sleep. Really cute, functional, and historic. Location was great, especially if you are planning on going to the beachcomber. Ptown was a short ride. Thanks for letting us stay! We had ten family members who upon arrival became quite comfortable. We loved gathering together for meals around the big dinning table and then retiring for relax and games in the lovely living space. The kitchen and bathrooms were clean and quite adequate. During the day great beaches, the ocean, and fresh water ponds, were all just a bike ride away. Charming shops, terrific restaurants, and friendly people regularly lured us back to the quaint little beach town of Welfleet. One would think Cape Cod in July would be overcrowded. Although there were many many vacationers, our space in the woods was tranquil, allowing us to unplug and enjoy. We had a great stay at this house. The location is excellent, you can walk to town (which does require a run across Rte 6 if you want the shortest route) very easily, and it is a quick drive to bay beaches, ponds and the ocean. The stairs are steep (like all old houses on the cape) so my 78 year old mother stayed in a room downstairs with a pull-out futon. A nice outdoor shower, as well as an indoor shower on the first floor (the second floor bath only has a tub). Five full bedrooms upstairs, and our extended family fit in well. The beachchairs provided were a bonus - we spent many days up at Head of the Meadow(our favorite ocean beach) and used those chairs well. Everything was cleanand the kitchen was well equipped. No A/C - but great fans in every room, and the house cooled down fine (even on hot/humid days). We have stayed in a lot of cape houses, and our options are always limited since we need 5 bedrooms and a place that allows dogs - this is one (of the few) that we would return to again. Great Cape Cod house. Location it was great to be able to walk to town and to both Dyer and Great Ponds what a treat! The ponds and town are all about a pleasant 20 minute walk away, and there are fire roads nearby for great running. The house itself is lovely - built in early 1800s, charming and very comfortable. Great features included: fans in every room (helpful during a rare warm Wellfleet week), kitchen well equipped for people who enjoy to cook, excellent supply of beach chairs, great outdoor shower and grill. We enjoyed our stay and we will be back! Great property with an unbeatable location and plenty of space. Owner is responsive and accommodating. House is just minutes from Cahoon Hallow beach and the famous beachcomber bar/restaurant. Can't ask for a better spot for a large group or family in Wellfleet. We just returned from a fantastic two-week trip to Wellfleet. We loved everything about the Cape Cod summer house, from the comfortable and inviting furniture to the close proximity to Great Pond, beaches, and Wellfleet town center. The house is spacious, beautiful and charming, full of historic touches yet also modern amenities, like renovated bathrooms and new kitchen appliances. We loved the big yard and the outdoor furniture, especially the thick cushions on the couch and chairs, and the inviting hammock. The owner goes out of her way to enhance your trip, providing great advice regarding restaurants and points of interest. She also provided us with fantastic new beach chairs with attached coolers, which we used almost every day of the trip.This was a family reunion and my daughters kept thanking me for finding this wonderful house. This was a generally well-equipped property in a good location. It is necessary to drive to the ponds and ocean beaches. Some are more accessible for large families/small kids than others, so drive by everything before you choose your favorite beach venue. Parking is easy once you have Wellfleet parking stickers. Be sure to avail yourself of all parking regs and fees. The house itself is comfortable for a large family with a range of ages (2-72). There is plenty of outside play space, a great grill and good parking. It is clean and well stocked with eating utensils, cooking utensils and dishes. Our owner provided an extensive, accurate list of restaurants and local activities. We didn't come close to doing everything we would have liked. As everyone says, the outdoor shower is terrific as are all the major appliances and there is plenty of hot water. I would recommend this to any family groupthis is a user friendly property, clean and unpretentious. We booked last year for a warm week in September. Nothing but positive things to say about this place! My favorite part? The brand new OUTDOOR shower! Nothing like getting back from a long day at the beach with a refreshing shower as the sun peeks through the backyard trees. Rustic and charming! The perfect home base for enjoying Wellfleet's Oceanside AND Harbor side. Loved spending nights reading in the big, comfy furniture in the great room, and sharing meals in the wood paneled dining room. It was just the relaxation we needed after a busy summer and before an even busier winter. Came all the way from the Netherlands! A lovely, comfortable, well-equipped house centrally located to take advantage of the many attractions of the outer cape. The owner and family member caretakers are helpful and go out of their way to accommodate your needs and desires. We had a wonderful time and so enjoyed being with our entire family in your big sea captain's house. We made great use of the big dining room table, playing cards and doing puzzles! Between the beaches, biking and catching frogs at Gull Pond, everyone in the family had something they enjoyed doing best. Thanks for making some great restaurant recommendations - so much to do in Wellfleet! Thanks and we hope to be back next summer! Rental process couldn't have been easier. Great service. Home was so comfortable and clean. Newly remodeled, it had new carpeting, all new bathroom, appliances, mattresses, Wireless Internet, etc. Central Location to beaches, ponds and town of Wellfleet was awesome, large yard, BBQ grill and fully equipped kitchen. This house was wonderful with lots of great history. What a great spot to relax. Can't wait to go back.